After 7 long months and an enormous amount of work, we’re at long last ready to announce a new comic book project that’s bound to raise some eyebrows. I’m happy to bring to you the story that’s been growing inside me for years, the comic book story that I want to read, the comic book story I must tell. 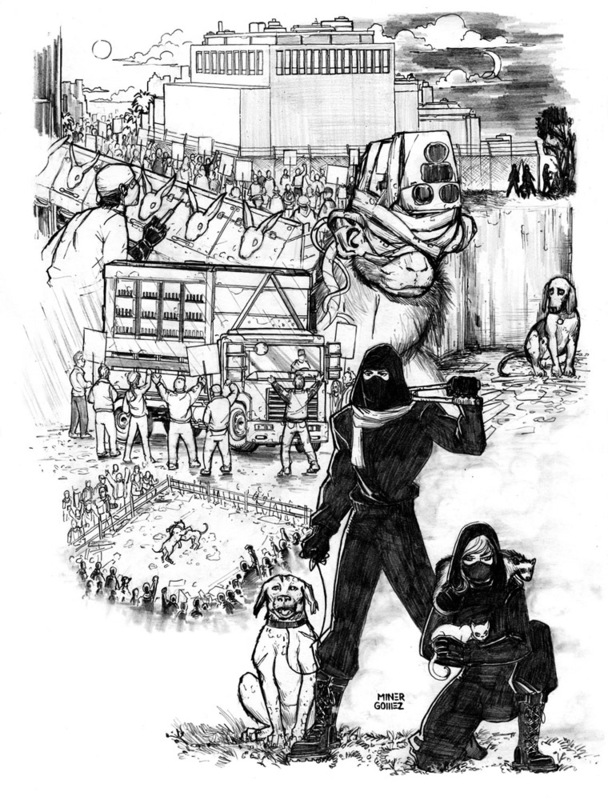 A mix of Mission: Impossible and the Weather Underground, Liberator draws on my lifelong love affair with comics and superheroes, my empathy for animals, passion for the animal rights movement, and deep respect for the animal rights underground to bring you a story that’s truly new and will most certainly open a few eyes and cause a few headaches. …burn the fucker to the ground. Liberator, coming late 2012 (tentative), is an unapologetic look inside the dark world of young activists embarking on an incendiary ethical crusade to confront animal abuse and give voice to the voiceless. With art by the phenomenally gifted Joel Gomez (Lost Boys: Reign of Frogs, Wetworks, Detective Comics), colors by the brilliant Beth Sotelo (Fathom, Supergirl, Witchblade) and edits and letters from the very patient and talented Vito Delsante (Batman Adventures, FCHS, Superman), Liberator is a collaborative effort that brings together our passions for comics and social justice in a way nobody has ever done before. Stick around – it’s gonna be a hell of a ride! ← Facebook author page is up!